“Parachute,” written by Chris Stapleton and Jim Beavers, is one of my favorite songs on Traveller. It delivers a universal message in a very economical package. For example, you’ll find a single chord progression repeating itself, sparse imagery and a few missing rhymes! 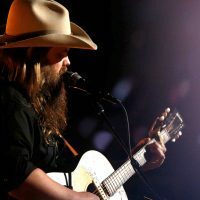 We’ll take a deep dive on Chris Stapleton’s “Parachute”, detailing what makes the song work, including the unorthodox approach to the line lengths in the verses, and how to incorporate some of his unique writing techniques into your own songs. Written by Stapleton & Jim Beavers, “Parachute” uses a metaphor without ever incorporating it in a literal fashion into the song. Pretty unusual. For the most part, when you’re writing for Nashville, the clever connection between your metaphor and phrases within in the song are often encouraged. This song does just the opposite. There’s also no specific reference to whether or not the speaker is talking about a lover, a friend, a person they once knew who died or for some reason went downhill. It leaves the exactness of the situation open. This gives the metaphor room to work in a variety of situations for a listener. On it’s surface, this is a simple song. The phrasing is simple, the structure is simple, the line lengths – simple but at the same time, very cleverly done.